Affected passengers should call 0800 727 800 for more information. CUSTOMERS flying to and from London Heathrow, London Gatwick or London City airports are being advised to check for cancellations. 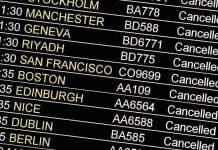 While not all flight have been cancelled, BA have stated that there is a significant reduction in the amount of scheduled flights. Flights booked up until March 4 for long haul or March 6 for short haul, regardless of whether it is showing as operating or not, can be re-booked up to and including March 21.